The two promotional strategy which is applied to get the product to the target market is Push and Pull Strategy. While in Push strategy, the idea is to push the company’s product onto customers by making them aware of it, at the point of purchase. Pull strategy, relies on the notion, “to get the customers come to you”. The two types of strategies differ, in the way consumers are approached. The term is derived from logistics and supply chain management, however, their use in marketing is not less. The movement of a product or information is the essence of push and pull strategy. 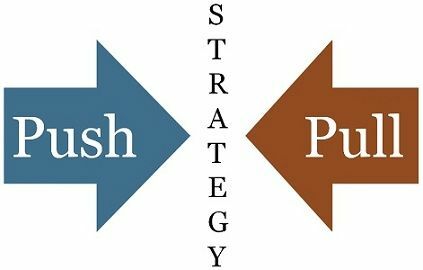 This article excerpt may help you in understanding the difference between push and pull strategy. Meaning Push strategy is a strategy that involves direction of marketing efforts to channel partners. Pull strategy is a strategy that involves promotion of marketing efforts to the final consumer. What is it? A strategy in which third party stocks company's product. A strategy in which customers demand company's product from sellers. Objective To make customer aware of the product or brand. To encourage customer to seek the product or brand. Uses Sales force, Trade promotion, money etc. Advertising, Promotion and other forms of communication. Suitability When the brand loyalty is low. When the brand loyalty is high. The strategy wherein marketing channels are used to push the product or service to sales channel is called push strategy. It explains the movement of products & services and information through intermediaries to the final consumer. In this strategy, the company takes their product to the customers, who are neither aware of it nor seeking it but the product is introduced to them, through various promotional activities. The strategy uses trade show promotion, the point of sale display, direct selling, advertisement on radio, television, emails etc. to make an impact on consumers mind and reducing the time between discovery of product and purchasing it. The business strategy which aims at generating interest or demand for a particular product or service of the target audience, in a way that they demand the product or service from the channel partners, is called pull strategy. In this strategy, the consumer demands are intensified by directing marketing strategies on them, which results in the ‘pulling’ of products. Pull strategy uses methods like social networking, blogging, word of mouth, strategic placement of a product, media coverage and so on, for reaching a large audience. In finer terms, any methods which are used for creating consumer demand for the product is called Pull strategy. It is one such strategy, in which customers actively seek products of a particular brand, due to its goodwill, quality, reliability and reputation. The type of marketing strategy which involves direction of marketing efforts to intermediaries is called push strategy. On the other hand, the marketing strategy involving the promotion of marketing efforts to the end user is called pull strategy. In pull strategy, communication of products or information is demanded by the buyer, while in push strategy, no such communication is demanded. Push strategy aims at making customer aware of the product or brand. As against this, pull strategy encourages the customer to seek the product or brand. Push strategy uses sales force, trade promotion, money, etc. to induce channel partners, to promote and distribute the product to the final customer. Conversely, pull strategy uses advertising, promotion and any other form of communication to instigate customer to demand product from channel partners. Push strategy focuses on resource allocation whereas pull strategy is concerned with responsiveness. There is a long lead time in push strategy. However, it is just opposite in the case of pull strategy. Push strategy is best suited when there is low brand loyalty in a category. Unlike pull strategy, is appropriate for the products with high brand loyalty, where the consumers are well known about the differences in various brands, and they opt for a particular brand before they go shopping. Top multinational companies like Coca-cola, Intel, Nike and many others employ both push and pull strategies effectively. When push strategy is implemented with a well designed and executed pull strategy, the result is phenomenal, as it generates consumer demand.